Jenny Crickmore-Thompson has won Free Accommodation 1 time! "Delighted! This was an end-of-visit trip for my family from Canada, great way to celebrate!" We are the closest spot (1km) to the Hluhluwe/Imfolzi National Park. 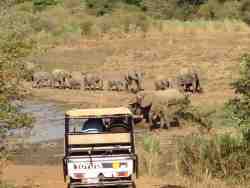 For the best 4x4 open vehicle game drives, visit Hluhluwe Backpackers. We call the Big 5 our neighbours and enjoy a stunning 360 degree view onto the surrounding hills of Zululand and the mountains of the Park in the distance. We offer a very warm and homely atmosphere in a unique and peaceful environment. Our main house has 5 comfortable double rooms with shared bathroom facilities. The kitchen is very well-equipped with all cutlery and crockery, an electric stove, gas plates, a microwave, fridge and freezer. If you are not in the mood for cooking, we can spoil you with one of our tasty, prior arranged, 'braai' or 'potjie' meals. (These are R85.00 p/p) The large garden area with a big boma/braai (bbq) area and outside eating area, offer you ample space to relax! We don not sell alcohol on the premises, but you are welcome to bring your own and enjoy it in our pub area,where you can sit and relax and enjoy your drinks. . All are under the shade of Marula and other indigenous trees. Our boma/braai area is there for your use as well as our self-catering kitchen in the main house. We recommend you to join one of our open-vehicle game drives into the National Park, conducted by a professional Field Guide. Further information regarding the game drives are available on request. Extras include Zulu dancing, fire shows, star gazing, bird watching, trips to St Lucia Estuary (we offer a 3-day trip, information of which is also available on request.) and surrounding areas including rural Zulu Villages. It's the ideal base to go explore the many, smaller, game reserves the surrounding area. Closest places include St Lucia Estuary (a World Heritage Site), where hippos' and crocodiles can be seen and boat trips be undertaken. Cape Vidal Marine Reserve is ideal for snorkeling and en-route to St Lucia, the rare Samango Monkeys can be spotted. The Swaziland Border is +/- 1.5 hours drive way from Hluhluwe We are in an area called Hluhluwe, which means 'Thorny Monkey Rope'. We are situated in the evergreen hills of rural Zululand, surrounded by only a few Zulu huts and with the mountains of the Imfolozi Park (River of Fibres) in the distance. It is a very tranquil, unique and peaceful environment. Although it sounds very remote, there are many places nearby and plenty things to do. All kinds of trips and excursions can be arranged.